On 2 May, 2017, the Centre welcomed Robert Maslen, Geraldine Parsons, and Thomas Clancy (University of Glasgow) to host a Celtic Fantasy Round-Table Discussion. In this seminar, each of the lecturers had chosen an early medieval text to compare and contrast with a modern fantasy novel which had been based on medieval stories. Both the medieval and modern texts centered around themes of Otherworldly intrusion, transformation, time, and a sense of place. These comparisons were followed by an open discussion on why 20th fantasy writers turned to medieval Celtic literature for inspiration. Below is this listener’s summary of the discussion. Thomas Clancy began by discussing an early medieval Welsh text, the Mabinogion. He focused on the first branch, which features Pwyll, the Prince of Dyfed. The story begins with Pwyll, who decided to go hunting in a particular area of his lands. He became separated from his hunting party and encountered an Otherworldly hunter and his pack of dogs. The other hunter eventually identified himself as King Arawn of Annwn. The King needed Pwyll’s help, which necessitated the two to change shapes with each other. Thomas pointed out that this story starts off in much the way many modern fantasy novels do: a normal person goes out and does what they would normally do, and suddenly the Otherworld intrudes on the modern world. The theme of transformation in this tale also appears in the fourth branch of the Mabinogion, where Gwydion and Math create a woman out of flowers to create a wife for another character. The modern story Thomas chose to contrast these tales with a 1968 novel by an American author named Lloyd Alexander. 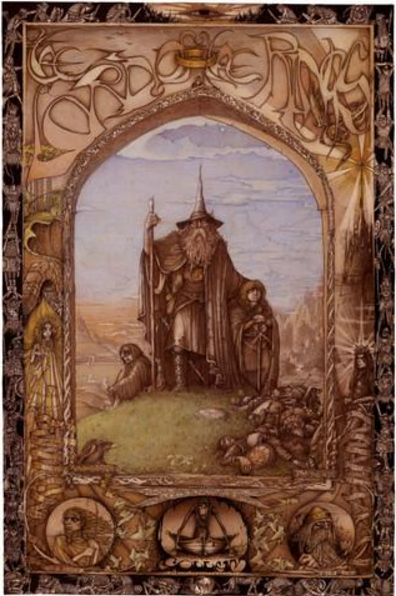 “The High King” is the fifth book from the Chronicles of Prydain. Thomas said that Lloyd Alexander created a different Wales by borrowing names and stories through Welsh medieval narratives to tell his own stories, but was not attempting to retell the stories from early medieval Welsh literature. In Alexander’s series, Gwydion is a magician who becomes an entirely good hero, while Arawn, who is still a shapeshifter, becomes a clear-cut villian, the lord of the land of the dead. Alexander’s tale becomes a story of good and evil, while the medieval literature portrays complex, supernatural, characters doing things that they would rather not do in complicated ways. Alexander’s vision of medieval Wales was described by Thomas as a “jazz” version of that described by the medieval texts. Geraldine Parsons chose to discuss the “Echtra Chonnlai” (Adventure of Connlae), an Irish text which may date to the 8th century or earlier, and is considered to be the earliest literary narrative we have in Gaelic. In the tale, Connlae is approached by a beautiful, Otherworldly woman who is invisible to Connlae’s father. She praises Connlae’s appearance and asks him to come with her to the “lands of the living”, where he would not age. A similar theme can be found in “Oisin in the Land of the Ever-Young,” which originally was part of the Finn Cycle, a tradition which gained in popularity from the 12th century onwards. Geraldine argued that these tales give us insight into how the Otherworld was viewed at this time: it is called the land of the living and is characterized by a luxurious peace. The people from the Otherworld are humanoid, but are healthier and younger. While they have familial relationships and apparently reproduce, all seem to be young adults. While they are usually thought to be immortal, they can be killed in battle. For her modern comparison, Geraldine chose to discuss “The New Policeman” by Kate Thompson. Thompson creates her own version of an Otherworld “Land of the Young”. In this novel, a modern-day boy living in Kinvara, Ireland, ventures into the Otherworld through a souterrain in the search for the gift of time. The Otherworld appears to be a mirror image of his modern Kinvara, with prehistoric and early medieval architecture, but without the modern feeling of a sense of urgency. The inhabitants of this world do not usually experience the passage of time, although time was beginning to affect their world. Geraldine stated that it was clear that Thompson was drawing on the Finn Cycle, especially because the characters in the novel frequently cited the stories of Tír na nÓg and Oisin. However, Geraldine argued that Kate Thompson was not just drawing on these sources, but was doing much the same as the authors of the early Irish sources: she thought about modernity, the new issues that face each generation and responded to it creatively. Rob Maslen discussed the poem translated as “Sweeney Astray” by Seamus Heaney. Rob said that what really struck him about the poem was the confrontation of the Judeo-Christian system of the world and Sweeney, who represents a different system of rules. In the poem, Sweeney is rude to a monk and, as a consequence is driven mad and is transformed into the form of a bird. Maslen said that there was a certain amount of ambiguity throughout the poem as Sweeney sometimes takes on more bird-like qualities and sometimes human-like qualities. Rob then discussed the works of Alan Garner, specifically The Weirdstone of Brisingamen and The Moon of Gomrath. Garner used Celtic fantasy in order to describe the area he came from, Cheshire, specifically the Alderly Edge. Garner drew on Welsh, Irish, and Scottish sources to create a mythology, which he then embedded into the landscape of Cheshire. In these novels, the two protagonists encounter a variety of characters from early literary sources, including a wild hunt, named in the novel as the “Horsemen of Donn, Einheriar of the Herlathing”. Thomas Clancy identified these horsemen as being from “The Destruction of Da Derga’s Hostel”, although given a Germanic name, perhaps to feel more at home in Cheshire. Themes of Otherworldly intrusion, transformation, ambiguity, place and time were all themes used in Celtic early medieval sources and are drawn on by modern ‘Celtic’ fantasy writers. During the lecture, Robert Maslen defined modern fantasy as the literature of the impossible, although he stated that it is unclear if the concept of impossibility had meaning before the Enlightenment. Would the events described in the early medieval literature have been considered impossibilities at the time they were written? While the storytellers of the modern era are responding to the stories told in the medieval past, the medieval storytellers were already including the fantastic elements. While the general discussion which followed the lecture touched on a variety of topics (including the nationalities of the modern fantasy authors in comparison to the places they were writing about), it became clear that the early medieval literature and the modern Celtic fantasy stories are not fantasy in the same way. Our seminar series for this academic year concludes on 9 May 2017 with Prof Steve Boardman (University of Edinburgh), ‘Personal names and bynames in Late Medieval Scotland.’ This lecture will be held at 5.30pm in Room 202 of 3 University Gardens. All welcome!